Including the women, in every aspects of nation building is necessary if we desire to achieve overall development. But the female candidates living in the villages are often barred from getting the facilities of education, communication and skill development. 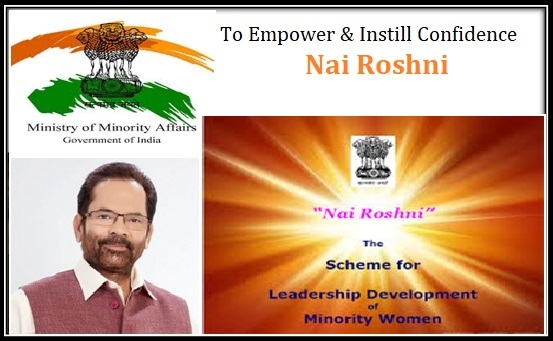 For providing these facilities and assisting the women, belonging to minority groups, in developing their leadership qualities and participation, the government has designed the Nai Roshni (Roshani) Yojana in all parts of the country. For the empowerment of rural and minority candidates – The implementation of the welfare scheme will assist in the development of the status of poor women, in the rural areas, who fall in the minority sections. Empowerment will be done via proper training. Type of training – Under the scheme, the organizations will provide both residential and non-residential training to the candidates. Number of beneficiaries – As per the report of the government, the scheme was launched with the target of catering to 50,000 women. As time progressed, and the scheme began to gain ground, the target was also raised. Duration of training and number of candidates – All the non-residential trainings will not last for more than six days but the residential ones may be longer. Each batch must have a maximum of 25 candidates only. Coverage area – The scheme was implemented in two states to start with but then, eight separate areas were brought under the scheme. Those state are West Bengal, Assam, Punjab, Andhra Pradesh, Gujarat, Kerala, Uttar Pradesh and Rajasthan. Implementing betterment via training modules – Another interesting feature of the scheme is that all development activities and programs will be based on training modules. These will be created based on the local needs of the area. Stipend for the trainees – All the trainees will receive training under the scheme will also be given an allowance by the government. This is to encourage the participation of women. Apart from this, crèche and meal arrangements will also be provided. Age bar – Earlier it was highlighted that women between age groups of 10 years to 35 years were eligible for taking part in the program, it was later changed and now the age bar for applying for the scheme is 18 to 65 years. Must belong to minority community – As the program has been designed for the development of the women belonging to backward classes, all minority communities will be permitted to apply for acquiring the benefits. Income bar – It has been highlighted that the yearly income of the candidate or the family must not go above the mark of 2.5 lakhs, otherwise the candidate will not be permitted to apply. Must have BPL certificate – The implementation of the scheme has been done for the betterment of poor women. Only those applicants will be chose who fall in the BPL category. Aadhar Card of the candidate – All candidates must provide a copy of their Aadhar Card with the application form. It will come handy during verification of data and monitoring progress reports. Age proof and residential proof – It is important for the candidate to provide documents that will assist the authority in making sure that both the age and residential requirements have been adequately met. The PAN or the Aadhar Card will be accepted for this. BPL and minority certificate – The program is especially designed for the developing the condition of poor women, belonging to the minority groups. Thus, the production of the BPL and the minority certificate is a must. Income certificate – As the program has an income bar, it is mandatory for the candidates to attach an income certificate with the application form. Bank account details – The candidate or the trainee must have an operational bank account so that the money can be transferred directly into the account. Digital Literacy – It has been decided by the authorities that the assistance of digital literacy will be taken to meet the requirements of the women and provide them with better chances of developing skills. Area based training module – The needs of each area is different from the other. Thus, some training modules will be created to meet the requirements of the specific local areas. It will be done in the local language. Health and hygiene of the area – Another aspects that will be addressed, is associated with the health and hygiene of the village area. The creation of the modules will require inputs over smaller time spans. Empowering the educational sector – Educating the women is the main aim and the training modules will be creating accordingly. It has been highlighted that AV media will also be used for telecasting case studies. All these will make the entire program more intriguing. Consulting with other agencies – For better creation of the modules, the authority will also consult with the private agencies, if and when the requirement arises. All the modules will only be implemented after approval from the Sanctioning Committee. Other aspects of the modules – Other aspects of the training module are associated with the Swachh Bharat Yojana, developing the life skills of the candidates and the legal rights of the women. Only those organizations that are dedicated and motivated towards promoting betterment of women will be allowed entry under the scheme. The organizations must be working for at least 3 years and must have all required legal documents. Only those agencies will be allowed who will be able to provide audited account details for previous 3 years. Moreover, they should not have any deficit in the account. All the local level organizations, which have been involved in developmental activities or programs for women will be given preference. The presence of trained and experience trainers is a must. If the training requires residential facilities, it is mandatory for agency to accommodate 25 trainees. Otherwise they will not be selected. For the proper implementation of the scheme, the selection of the agencies or organizations will be done directly by the Ministry of Minority Affairs. The particular projects or training schemes will be implemented by the trainers of the organization, in the rural regions that fall under them. All the responsibilities, associated with the implementation of the scheme, in a particular area, will rest on the shoulders of the agency that has been selected by the government department. As it has been highlighted in the scheme, the selected organizations will be provided with financial assistance by the government for proper implementation of the developmental program. Each organization will acquire Rs. 25,000 for holding the training sessions for 5 separate batches, in case the training is non-residential in nature. If the training requires residential facilities, then the government will provide Rs. 15,000 per batch. http://nairoshni-moma.gov.in/OrganizationRegistration.aspx This link will provide the actual registration page. The name, address, area, Pin Code, registration date, registration code, type, contact details, achievements of the organization, forte of the organization, etc must be typed in. The name and details of the CEO and VP of the organization must also be provided. Once this is done, the button marked as “Generate OTP” must be clicked. It will generate the 4 digit code and it must be typed in the proper field. Last but not the least; the button marked as “Registration” must be clicked to submit the form. It is mandatory that the organization possesses a website and it must contain the details of its heads. The organization must also have the GPS systems for taking pictures of the significant activities. Other than this, the organization must take up all responsibilities for implementing the program in the proper manner. All funds, provided by the Ministry of Minority Affairs must be kept in a separate account and the details must be sent to the government authority when asked for. The money must be sent on the particular cause and nothing else. The organization will have to sign a declaration that if it is found that the organization is spending the money on something else, then the agency will have to pay a penalty that is 18% of the total grant that they received. The interest along with the actual amount will have to be refunded. When the project has been completed, the organization will have to notify the Ministry of Minority Affairs and fill a form. After this, they will have to provide the audited account to the authority. It is the responsibility of the organization to notify the OAMS so that their officers can come and inspect the activities. When everything is done and the officers of OAMS are satisfied with the task done by the organization, they will forward the papers and the government will release the funds. With the assistance of this scheme, the government will not only be able to develop the situation of poor women, belonging to the minority groups, but they will also be able to take the assistance of the agencies or organizations, working in a particular area to bring about the development of the residents. A six-day long training schedule has been proposed by Destitute And Handicapped Welfare Association or DAHWA for the minority group and rural women. This training program has been planned under the Nai Roshani Scheme aiming for the development of the minor women. Different topics such as leadership, life skills, health and hygiene, Swachh Bharat, legal rights, and the financial system would be educated with the help of audio-visuals. Resource person like Geeta Devi coordinated the program. Chief Guests like Tehsildar and Ved Prakash distributed cheques to the women and suggested the women use their training effectively. The main aim of the scheme is women empowerment.